"Top o'the morning to you!" Whenever Mr Monkey decides to hide pots of gold under rainbows, or to grant wishes to the Big Folk, he dons his leprechaunish top hat. Apparently, this sort of hat is pretty much standard headgear for leprechauns, which strikes us as a little unlikely. 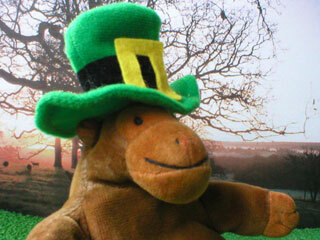 Mr Monkey's leprechaun's hat is made entirely from felt, and was, basically, stolen from a leprechaun purchased from the main tourist information centre in Dublin.